It’s been a really, really long day. 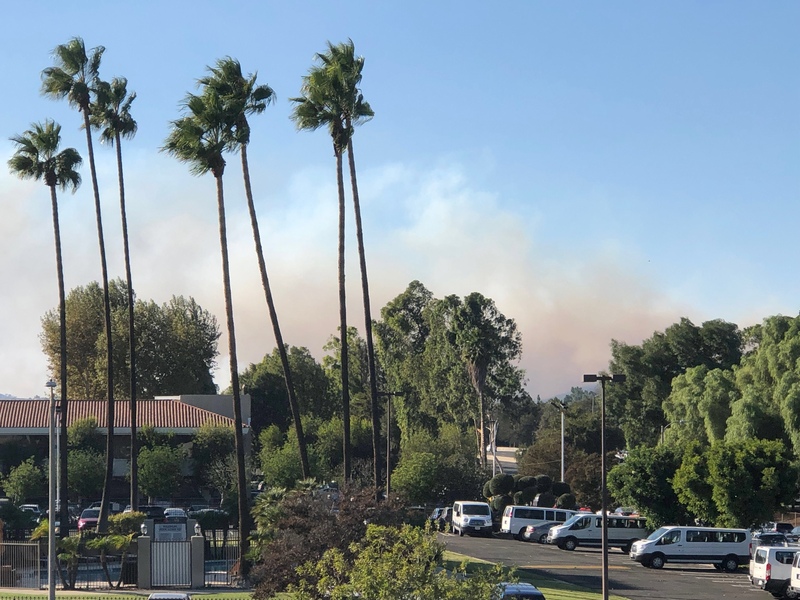 For the longest time this afternoon and evening I thought that I might be writing this tonight (if I were able to write anything at all tonight) from a hotel or a Red Cross evacuation center. I’m still at home and it’s now looking like there won’t be a need to evacuate tonight, but it’s been touch and go for hours. We’re still packed into two cars and ready to go in 60 seconds if we get the word. I was up a couple hours early for a big, all-day work event – that was cancelled early due to many of the key people either having to evacuate last night out of Westlake Village, Thousand Oaks, or Agoura, or because they were up all night preparing to evacuate if necessary, or because they couldn’t get here either way due to the multiple massive freeway closures caused by the fires. 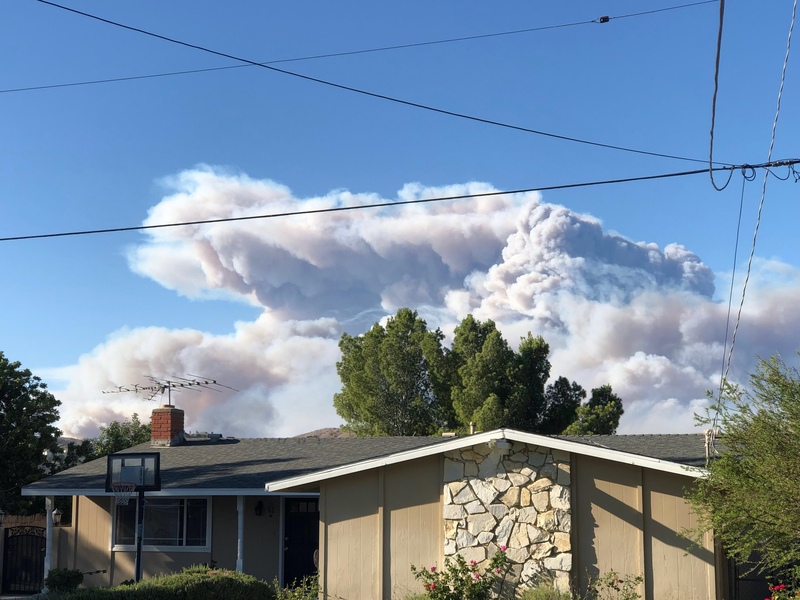 This was what that fire looked like when I first got up this morning, off in the distance, pyrocumulus clouds billowing up to 8,000 feet or more. 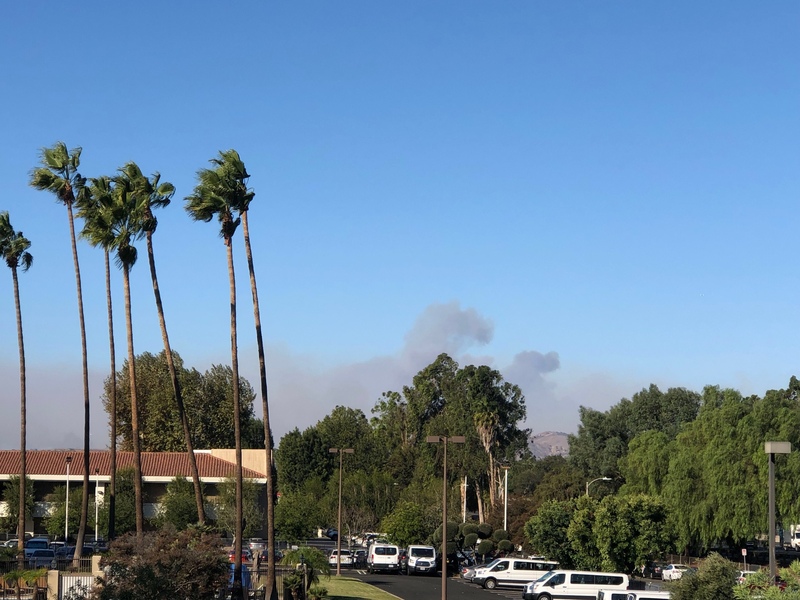 But from the office, the smoke rising up from the fires smoldering near our house was pretty benign. By the middle of the afternoon, that had started to change. 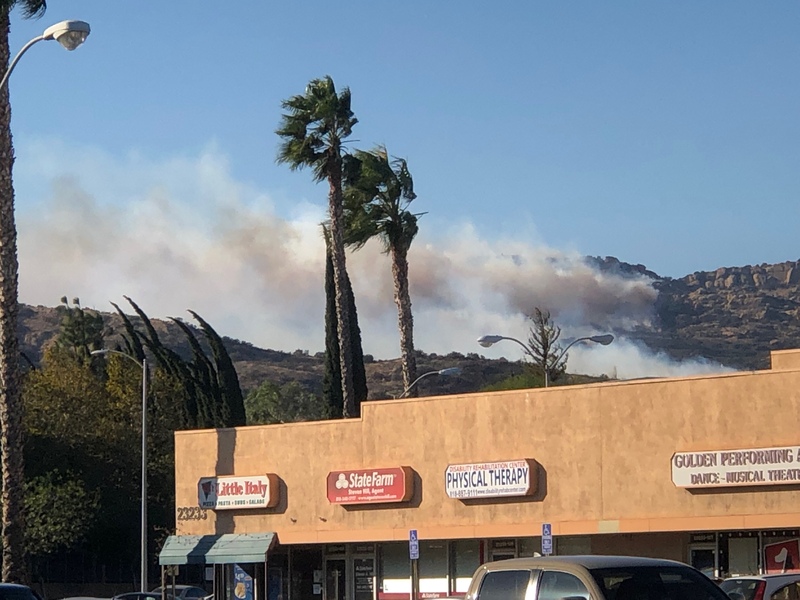 While everyone pretty much thought that the fire near us had died down and was almost done, the right combination of wind and terrain kicked it up and I needed to bail out of the office early and get home. 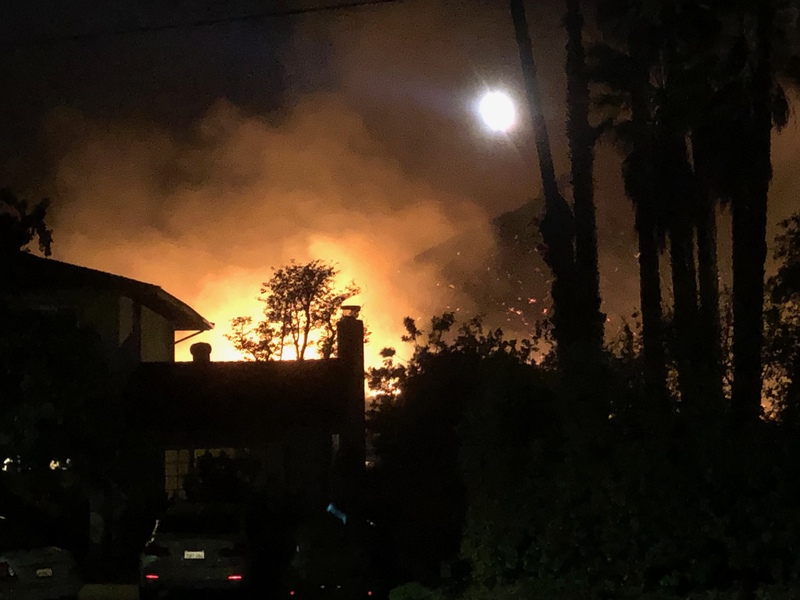 I couldn’t even get home by the shortest route, so ended up by the old house where for the first time I saw that the fire had crossed the ridge from Ventura County into LA County. This view shows the northern end of the ridge, up by Chatsworth, but it was the same for ten miles, all the way south to Calabasas. Remember how I said last night that I wouldn’t worry until I saw active flame coming over the ridge at Castle Peak? Here it is. For the longest time I wasn’t too worried about it. It took a couple hours to burn from the top of the ridge down to here. At that rate it was never going to be a threat. I started loading up the cars with the valuables (photos, hard disks, overnight bags, important documents, etc) but figured it was just to get my exercise, not because we were going anywhere. Then, about an hour before sunset, all hell broke loose. All along this ten-mile ridge line the fire just exploded. 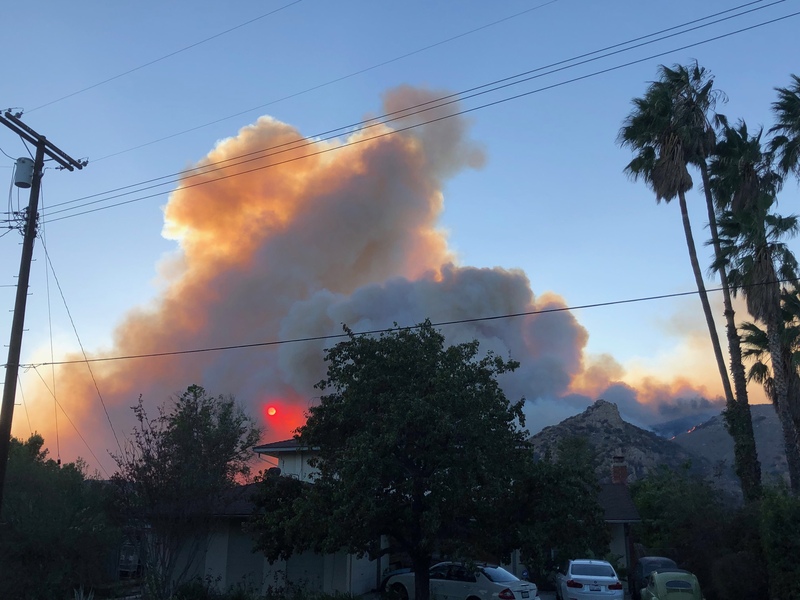 The wind kicked up, the smoke started rising, and the flames started marching down the east flank of Castle Peak toward the homes at the bottom. I was betting that the firefighters’ strategy was to let it burn like this as long as it was burning brush and open space. 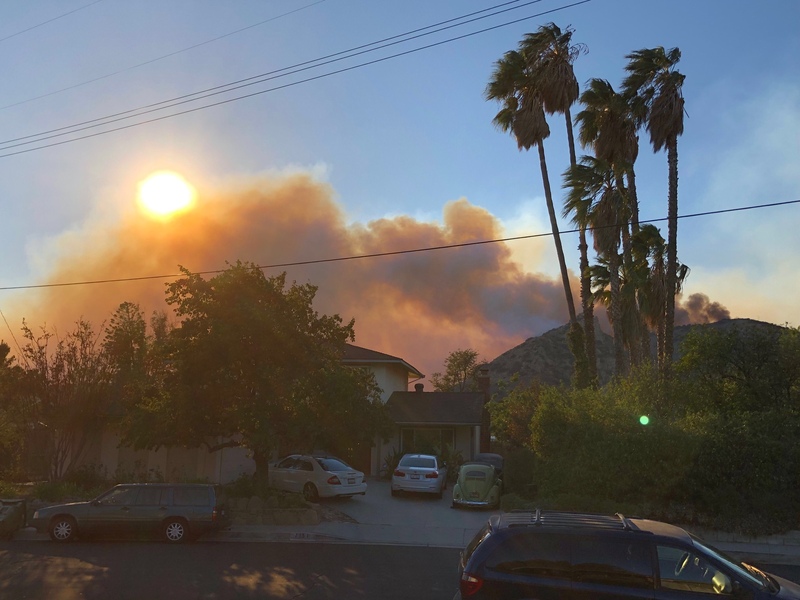 Then, when it gets to the houses, which should all be properly prepared with set back areas from the brush and defensible spaces all around, the fire gets hit hard and stopped in its tracks. 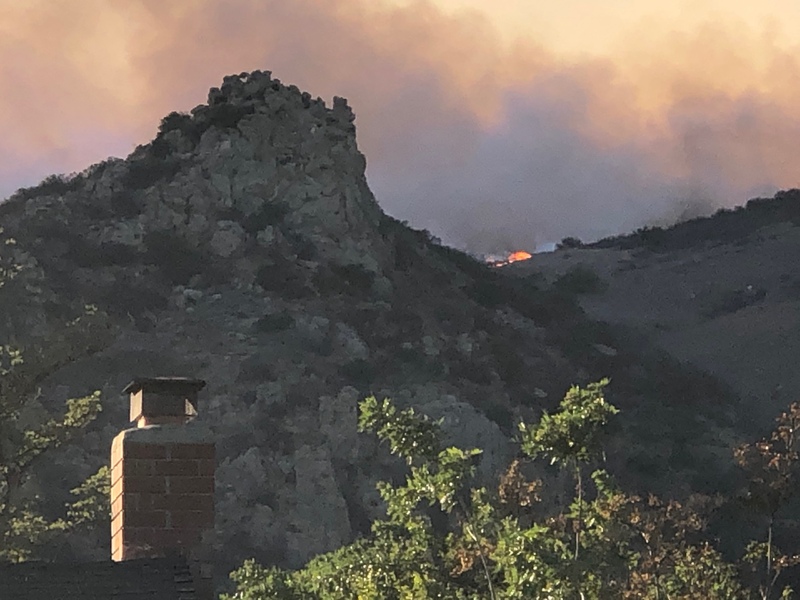 That’s pretty much what happened – here you can see the fire as it got to the base of the hill and the houses there, with a water-dropping helicopter above. It’s a good thing that it worked. If the houses at the bottom of the hill had gone, a lot of embers and debris would have been thrown up into the air. The high winds would have pushed those embers out downwind into houses blocks away, starting new spot fires, with the pattern just repeating over and over. (Look at what happened last year in Northern California, or two days ago up by Chico, or a couple decades ago in Oakland for examples.) 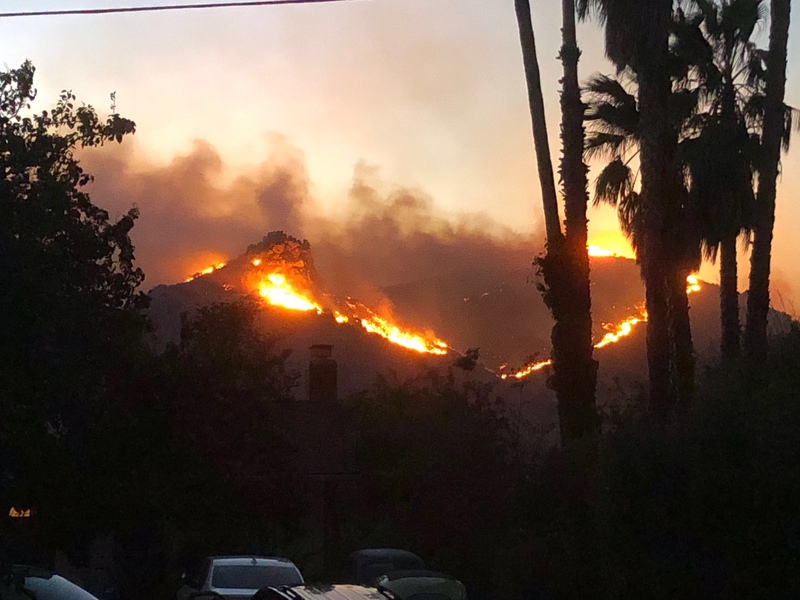 From those houses it’s about three blocks to Valley Circle – once the flames crossed Valley Circle it’s only three blocks up hill to us, and we all know how much flames love to climb up hill with a 45 mph wind pushing it! So we had our two cars packed, on a hair trigger. Several of our neighbors found the point when their bug-out button gets pushed. I decided to stick it out. Now the wicked winds have died down. I knew it even before I stopped noticing the wind – for the first time in this mess I can smell the smoke. Even though it was so close, less than a half mile, I haven’t smelled any smoke at all because of the ways the winds have been blowing . Not now. With no winds, the smoke just sits in the valley at the west end of the San Fernando Valley, starting to choke me. So tonight I might sleep fully dressed and with one eye open and one ear listening for sirens and someone pounding on the door, but I will be sleeping at home. And don’t worry, I *WILL* be able to sleep. I thought I was exhausted before this – I had no clue what real exhaustion was. If you’re interested, you can probably catch live coverage on KTLA 5, CBS LA 2, or any other Los Angeles television station’s website. Or you can watch several Facebook Live posts that I put up today. It must be really scary. The big problem with leaving it late is you find yourself in a traffic jam with crosswinds coming at you, so don’t leave it it the last moment, please! We seen the dreadful scenes at ‘Paradise’ on our screen today. Thanks, Jemima! We were watching the traffic, news, and fire alerts, not going to get caught. Paradise got wiped out, which may be the ultimate allegory for our times. That fire is way up in Northern CA, probably 500 miles away. 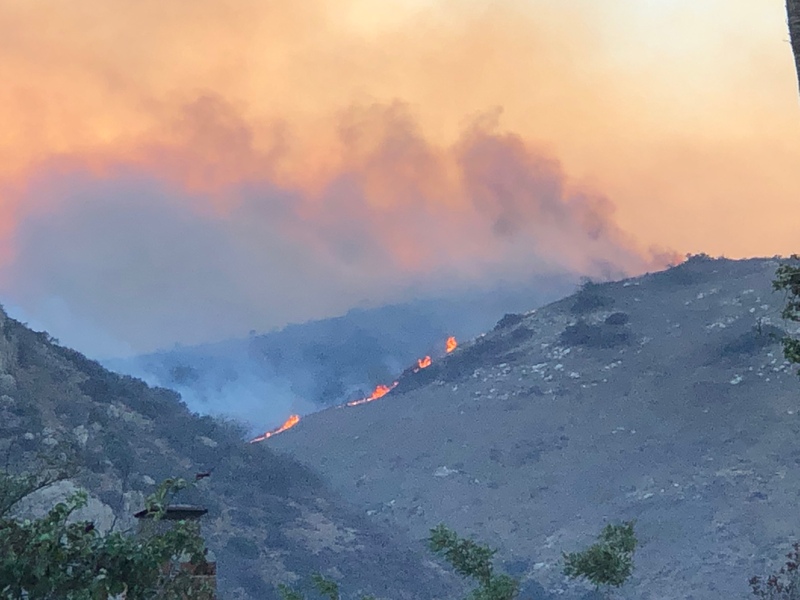 Here we lost a few hundred homes, the closest ones a dozen or so in Bell Canyon, which is only a mile away.